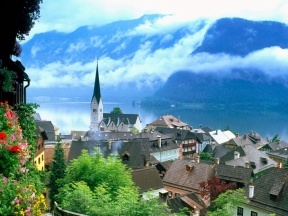 Austria, a country with a great wealth of history, culture, tradition and architectural wonders, is fast becoming a major holiday destination for travelers from all around the world. After its neighbor country Switzerland, Austria is the next most popular winter sports capital in Europe. However, the country sees equal number of tourists, who arrive to see the breathtaking historical sites and hike the heart-stopping alps scenery, during summer days. *Edit: Austria has been chosen as the fourth safest country in the world on our list of safest countries. Come see why! This one of its kind middle age castle provides countless opportunities for fun and entertainment. Besides a plenty of enticing things inside, there is also a zoo and a beautiful garden situated just next to it. The Schlossberg hill is located in the heart of this city and spread over an area of 500 meters. Graz is the culinary capital of Austria and home to numerous cafes and restaurants with amazing views of the rural life.